The mission of The Rescue Institute is to save the lives of 10 million executives worldwide! 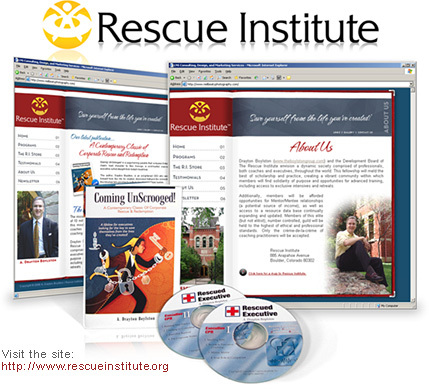 In order to fulfill this mission The Rescue Institute recruits and trains coaches worldwide in the Rescued Model of coaching as developed by Drayton Boylston. In creating their web presence, LNS met with the principles, toured the Rescue Institute, and learned all we could about their objectives and their target audience. In addition to an extensive on-site photo shoot, we were able to interview the founders and get the feel of all aspects of the project. The decision to create a website with a scholarly "book-feel" has been met with considerable positive feedback.